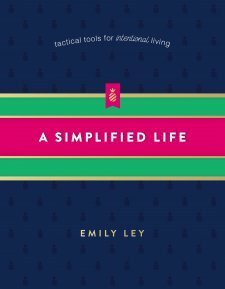 When A Simplified Life by Emily Ley arrived, I was pretty excited until I opened the box and saw how perfect it looked. That may seem odd, but in the midst of packing for holiday travels and feeling behind in work and Powersheets Prep the last thing I felt would be possible was to simplify, especially after seeing how thick of a book I’d received. How could simplifying take so many pages? And then, before I’d even finished the introduction I found myself exhaling a huge sigh of relief. With one sentence tucked into a three-part process, Emily enlightened me on how I’ve been setting myself up for failure over and over. Stripping down life to include what works together instead of competing is a journey I began in the fall of 2016 when I walked away from a ministry I’d developed at the peak of its success. Now, this wasn’t a ministry to included thousands of women or was nationally known, but it was the fulfillment of a mission God laid on my heart more than 15 years prior, while simultaneously being an immense strain on our family, my physical health, and my daily schedule. From the moment God whispered walk away while I was driving in September of 2016 I had been entering a season of less. That step of obedience turned out to be the beginning of God moving our family for the second time in less than 4 years. With the commitment to be still before God for a year I found the freedom to say no and goodbye. Our move certainly helped as did working from home. As with all good things, my season of less and choosing to be still, began to slip away before I realized what I was getting myself into my days were once again blurring into my nights and I was dreaming more about work than play. As we settled into our new community my one job which I was doing for 15 hours a week increased to 35 a week at the same time I began freelancing. I joined a BSF something I’d longed to do for over a decade AND an online Bible study just for coach’s wives. Reflecting on 2017 I can see a shift that has settled. My yes is slower, my no is firmer, and my decision to ask for help comes a bit quicker. The best part of this learning process is that God has helped me see how one joy, one focus can fulfill a calling, ministry, and employment (more on that in another post 😉 ). I am forever changed, and yet a simplified life still felt impossible. Enter the fantastic Emily Ley and my lightbulb moment. Pausing to confirm life choices work together rather than compete is not something that will happen overnight. And Emily in her wisdom understands that. But taking the time to apply the same process in all aspects of life is the ultimate goal, and by tossing the stopwatch away, it becomes attainable. Through ten chapters Emily Ley brings the reader through simplifying their home, finances, meals, schedule, self, and faith amongst other topics. There is no deadline to meet, and the brilliance of this hardback book is that it is sturdy enough survive the whole journey. A Simplified Life: Tactical Tools for Intentional Living is not a one-size-fits-all process. It’s not a do these 10 things, and life will work out. Best of all, it’s not about changing passions to fit into the idea of what this life might look life. It is a guide to help you think through the why behind decisions in addition to a book filled with tips, ideas, and strategies to choose from which will help life to actually be simplified. I give this book 4 out of 5 stars, it’s great and will speak to the majority of women who crave a simpler life, but if you aren’t married with littles, there will definitely be chapters you won’t find applicable. That’s ok, but it’s why this book really isn’t for everyone even if that’s what the introduction promises. In exchange for a free copy of this book via Book Look Bloggers I was asked to give an honest review. The opinions expressed are my own.